The house still had its original paint color of when we built it 18 years ago – a khaki green color. The trim around the windows was really suffering as well as two areas where squirrels had taken advantage of wood rot to gain access to the attic. The house was WAYY overdue for a repair and paint job! In the photo below, the paint is still drying on the left (and why it looks uneven) while the painter repairs our chimney stack. Boy, I can’t believe he got it done in 12 hours with just one helper! We had discussed possible paint colors with a real estate agent years back and she had recommended gray. The brick on our house is a red color (no orange-red) and had a gray/smoky black accent brick. As you can see from the photos we have a unique mortar – called “weeping mortar” – it is not a mistake and some people like it (like us) and some people don’t. We went around to some neighborhoods that were a notch above ours and scoped out a bunch of houses with brick about the color of ours that had painted the wood gray. Definitely liked it! However, we preferred the darker grays, not the light colors. 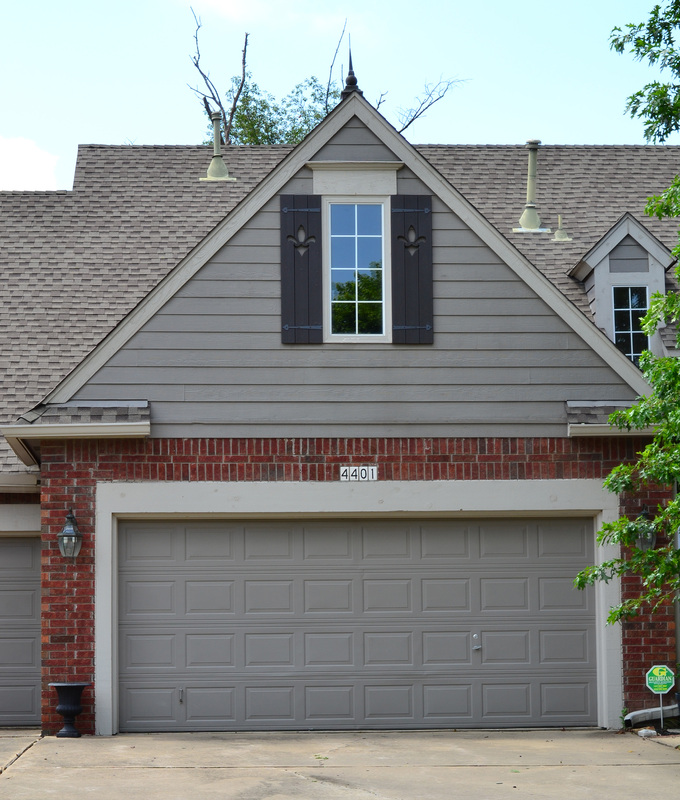 One thing we did not like was the really light color trim around the windows and roof trim. The white trim with dark color would look better in a Cape Cod neighborhood and with a house with alot more wood showing. For example, this house has a large wood facade over the garage, so the two colors of paint work! I also love the shutters! However, this style just didn’t suit or house and we both thought it chopped up the line of the house too much. Our front house profile actually has far more brick than wood and could handle a darker color in order to make a statement. Some people make out doing exterior house paint more complicated then it needs to be. Since we are reselling in three years, I just needed a nice neutral that showed off the brick of the house, and would be acceptable to a large number of shoppers. I didn’t need the exact right shade of gray out of 20 different test paints. 1.) 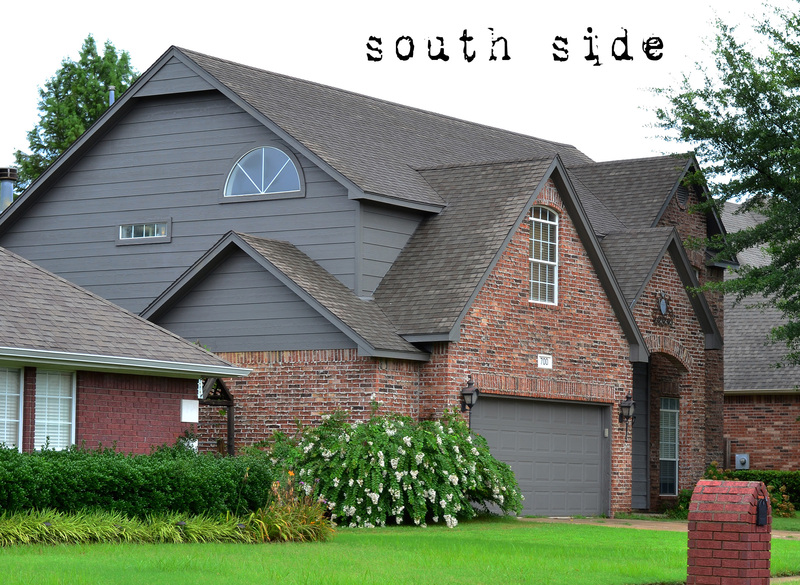 Drive thru neighborhoods with similar styled houses and take note of paint colors. Take photos. 2.) I had collected paint colors through Pinterest and read various blog comments etc… that were attached to popular colors in the color family I planned on using. 3.) Get some test paint samples and put on the house. Make sure the test paint is put on in a big enough area you can see it from a distance. Look at it in different lights and keep it up for a few days. See what you think. 4.) If not happy, go back to the paint store. 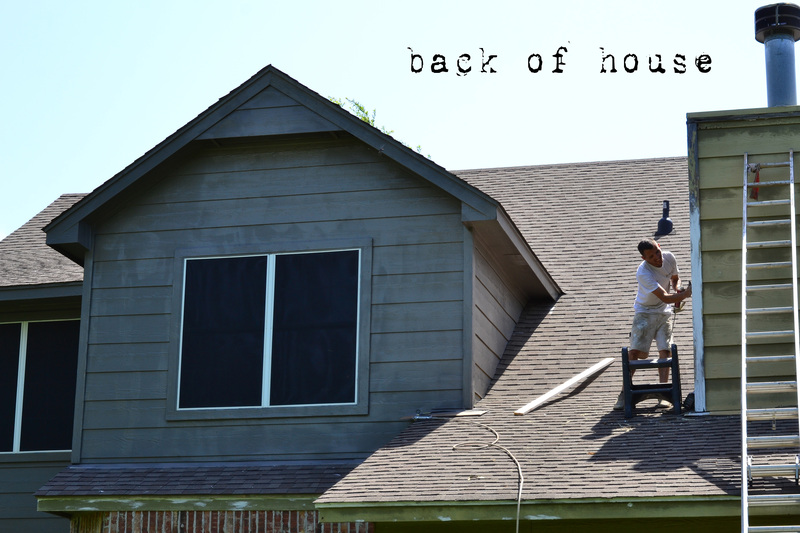 Painting a house is a huge undertaking and expensive. Better to invest in some more test quarts than tell the painter to stop in the middle of the job! Going darker, which we ended up doing, was taking our paint a little out of the comfort zone of many of the houses in our neighborhood. About 80 percent or more still sporting the same light taupe colors the builder had put on over two decades ago! We felt it was worth the risk as more expensive houses had gone darker in tone, and we wanted to stand out but not too much. Our Painter uses Sherwin Williams so we tried two shades on the front entrance (French Gray was the lighter) and we decided on the darker color, 7019 Gauntlet Gray (the painter chose a Satin finish which I LOVE!). 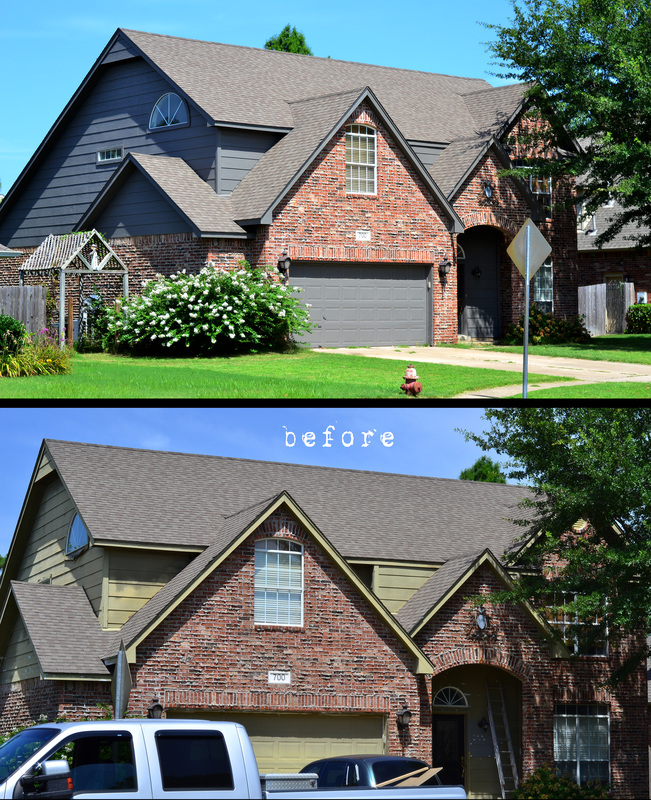 With the needed repairs, this was a $2,000 job for a professional house painter (someone we saw do a house in our neighborhood and who really impressed us with the work they did). I’ll get more photos once the sun comes back out. The brick color in the bottom before photo is more accurate. The top after photo was taken in really strong sunlight so the color is a bit off. New photos will be coming soon. This is just the beginning of the house exterior redo – we plan on putting up shutters and doing a hardware accent on the garage, as well as new landscaping. However, after the big expenses we have had, I’m going back to smaller projects inside the house.